A frantic appeal has been made directly to the Russian government to save Europe’s largest fruit and berry seed bank from real estate developers. The Pavlovsk Experiment Station is the largest European field genebank for fruits and berries, and is part of the N.I. Vavilov Research Institute of Plant Industry, where Russian scientists famously starved to death rather than eat the seeds under their protection during the 900-day siege of Leningrad during World War II. At issue is an effort by residential real estate developers to build houses on the land occupied by Pavlovsk Station. The take-over would involve bulldozing Pavlovsk’s field collections amassed over the last century – collections that contain thousands of varieties of apples, strawberries, cherries, raspberries, currants and other crops – 90 percent of which are not found anywhere else in the world. “It is a bitter irony that the single most deliberately destructive act against crop diversity, at least in my lifetime, could be about to happen in Russia of all places – the country that invented the modern seed bank,” said Cary Fowler of the Global Crop Diversity Trust. The fate of the Pavlovsk Station is now in the hands of the courts, and the case is due to be heard on Wednesday 11th of August. 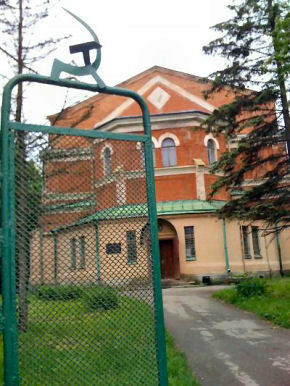 If, as feared, the court rules in favor of the property developers, and the Russian government does not intervene, Fyodor Mikhovich, the director of the station, predicts bulldozers will be on-site within three to four months, and then, in a few days, destroy almost a century of work and an irreplaceable biological heritage. The Pavlovsk Station was established in 1926 by Nikolai Vavilov, the man credited with creating the concept of seed banks as repositories of crop diversity that could be used to breed new varieties in response to threats to food production. Vavilov himself was persecuted for his views on plant genetics and died of malnutrition in prison in 1943. But Russia later renounced his treatment and has since treated Vavliov as a hero. Today, the N.I. Vavilov Research Institute of Plant Industry remains one of the world’s most important conservers of crop diversity. Today, the hundreds of hectares of fields at Pavlovsk Station contain more than 5,000 varieties, including 1,000 varieties of strawberries alone. Its crop collections are thought to possess a host of traits that could be crucial to maintaining productive fruit harvests in many parts of the world as climate change and a rising tide of disease, pests, and drought weaken the varieties farmers are now growing. As Pavlovsk is predominantly a field collection, it cannot simply be moved. Fowler and other experts estimate that even if another site were available nearby – and there is not one – it would take many years to relocate. There are efforts underway to craft an emergency relocation plan, but technical and logistical challenges make it unlikely that more than a small fraction of the collection could be transferred. For example, the most suitable sites for relocation are likely outside of Russia, raising complicated legal questions and quarantine issues. In an astonishingly Kafkaesque piece of logic, the property developers maintain that because it contains a “priceless collection,” no monetary value can be assigned to Pavlovsk Station, so, therefore, it is essentially worthless. Furthermore, the Federal Fund of Residential Real Estate Development has argued that the collection was never officially registered and thus it does not officially exist. Mass extinction event linked to invasive species Frog communities undergoing “McDonaldization” Biodiverse regions are hotspots for war Biodiversity Crunch Threatens Plant Productivity Icebergs – Oases Of The Ocean Limited Resources The Key To Biodiversity?